Editor’s note: Daniel Bengtsson (the tall guy next to me) is a former Shanghai resident, a frequent visitor to Earth’s Greatest City, and an avid birder. 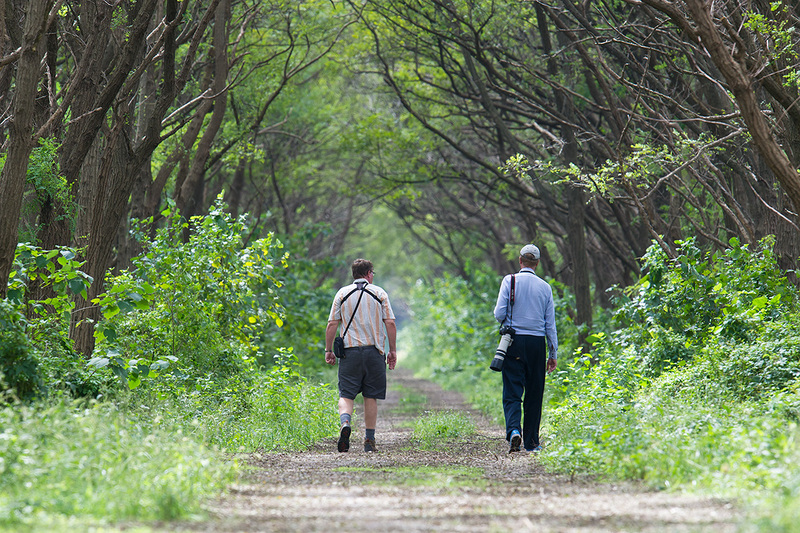 Daniel left his mark on Shanghai birding with his Century Park All-time Bird List, which he began compiling in 2008. The list stands at 135 species, almost all of them recorded first by Daniel, and is the best record ever made of the birds of a major Shanghai park. As I spent more than two years in Shanghai over a five-year period (2006-2010), and since Shanghai is the birthplace of my wife and daughter, this huge city will always be my second home—a bit unlikely, perhaps, considering I was raised in the Swedish countryside. My daughter is now 8, which means that we are limited to Christmas and summer breaks to visit the Shanghainese side of our family. We did our latest summer trip this past June and July. Any time I’m in Shanghai, I visit Century Park, my “home spot” which I birded more than 50 times back in 2008. This past summer, I birded the park twice, on 23 and 29 June. In contrast to other parts of Shanghai, Century Park has undergone little change over the years. This time, however, I noticed that Oriental Magpie-Robin had moved in. Other records of interest were singing Indian Cuckoo (2 birds seen), Eurasian Hoopoe with 2 fledged chicks, and Asian Brown Flycatcher (difficult to know whether it had already been to the breeding grounds and returned south or whether it had been delayed and was on its way north). To add more birding flavor to the visit, I asked my wife and daughter to do a family-plus-birding trip with me to Fujian. On 5 July we flew from Pudong Airport to Sanming in western Fujian. 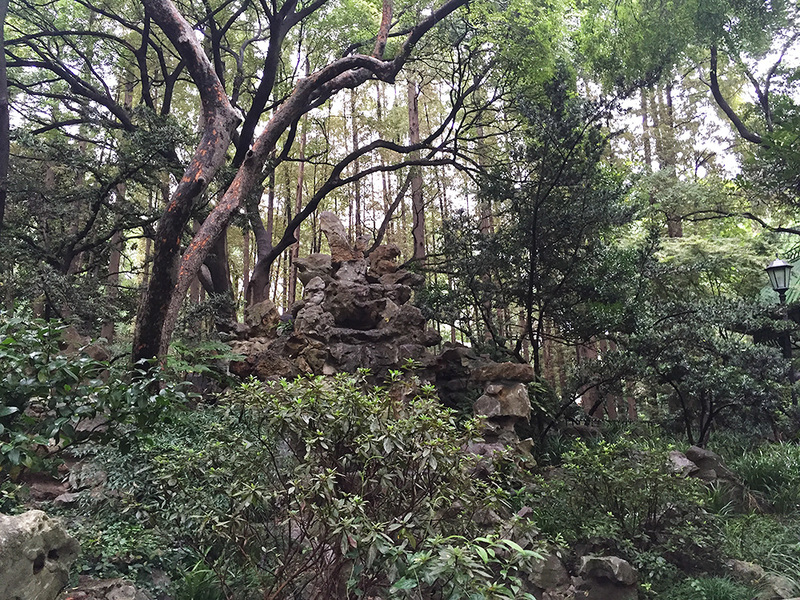 We were picked up and driven to Ziyun Cun (紫云村, 26.359541, 117.492287). Like Emeifeng 80 km to the west, Ziyun Cun, elev. 800 m, lies in hilly, thickly forested, sparsely populated country. The peaceful village of 1,000 inhabitants was a welcome contrast to hot and humid Shanghai. We stayed in a small family hotel which offered nice rooms and fresh, self-produced food at a very reasonable price. Both driver and hotel were arranged by birder Xiao Yang (小杨, +86 158-5982-8858). His parents run the hotel. 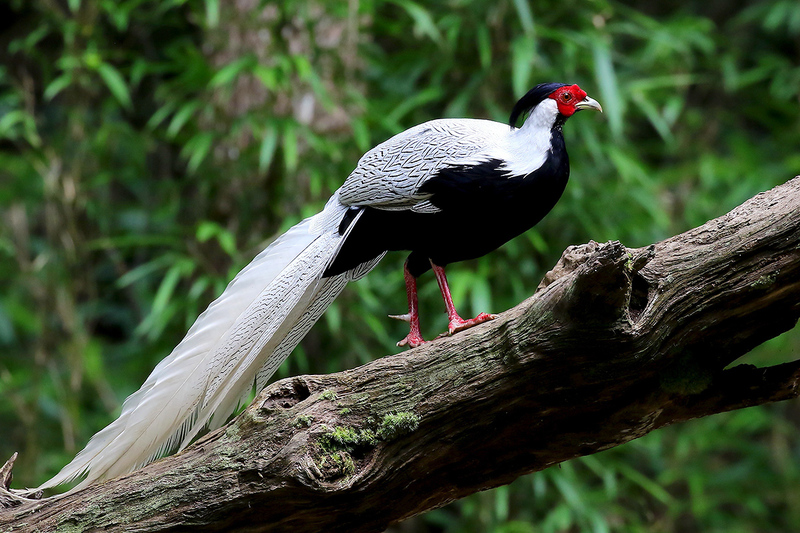 Among birders and photographers, Ziyun Cun is well-known for the temple on one of the nearby hilltops, often providing both Cabot’s Tragopan and Elliot’s Pheasant. 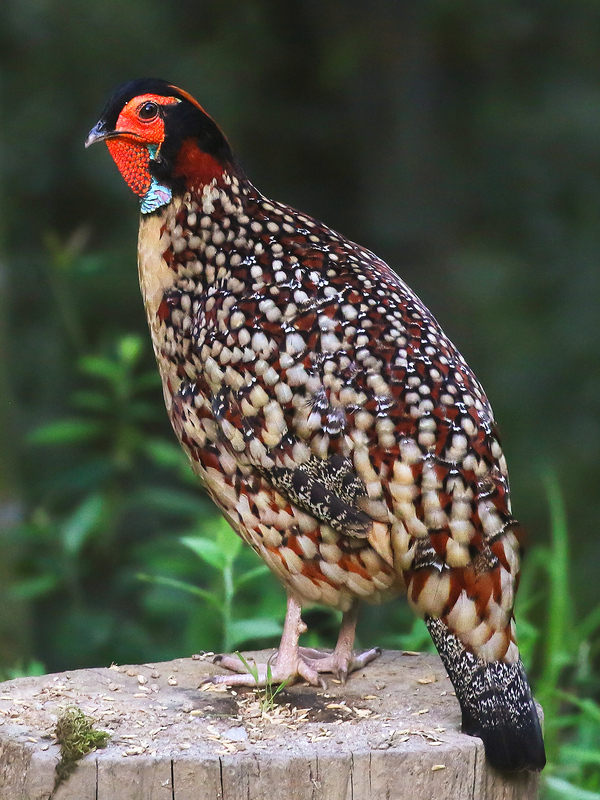 Although Elliot’s Pheasant did not show during the two days I spent in the area, I got fine views of the tragopan as well as of Silver Pheasant and Chinese Bamboo Partridge. Bird activity was low, and it was obvious that it was long gone into the breeding season. Though birds were calling little, I did manage to hear White-necklaced Partridge, Chinese Barbet, and Grey-sided Scimitar Babbler. Bay Woodpecker and Rufous Woodpecker showed nicely. Night birds were more active. By walking from the village to the temple (1.5 km) before dawn, I heard Collared Scops Owl, Oriental Scops Owl, Collared Owlet, Asian Barred Owlet, and Grey Nightjar. For 50 RMB another driver took us to the temple by car. This was a good deal when bringing my wife and daughter, since they would not have been too happy walking the steep track from the paved road up to the temple. Alongside the temple track, a stairway leads down to a different side of the hill. This side has better forest, and most of the birds were here. On the last morning, Xiao Yang’s father took me to a private hide at the base of the hill, where the better forest begins. Apparently this is too low for Elliot’s Pheasant, but it is reliable for Silver Pheasant (and sometimes Cabot’s Tragopan). The deal was that I would pay 100 RMB if I got to photograph either the pheasant or tragopan. (I recommend paying anyway, since this is a good way of supporting ecotourism!) The same deal goes for the hide at the temple. After two nights in Ziyun Cun, we were driven back to Sanming. We were dropped off at the train station and took the high-speed train to Fuzhou. Two mornings later, on 9 July, through the kind arrangements of the Fujian Bird Watching Society, I was picked up for a two-hour drive to the Minjiang estuary (26.023600, 119.653200). The Minjiang estuary is the only reliable site in mainland China for the critically endangered Chinese Crested Tern, a species whose total world population probably does not exceed 50. 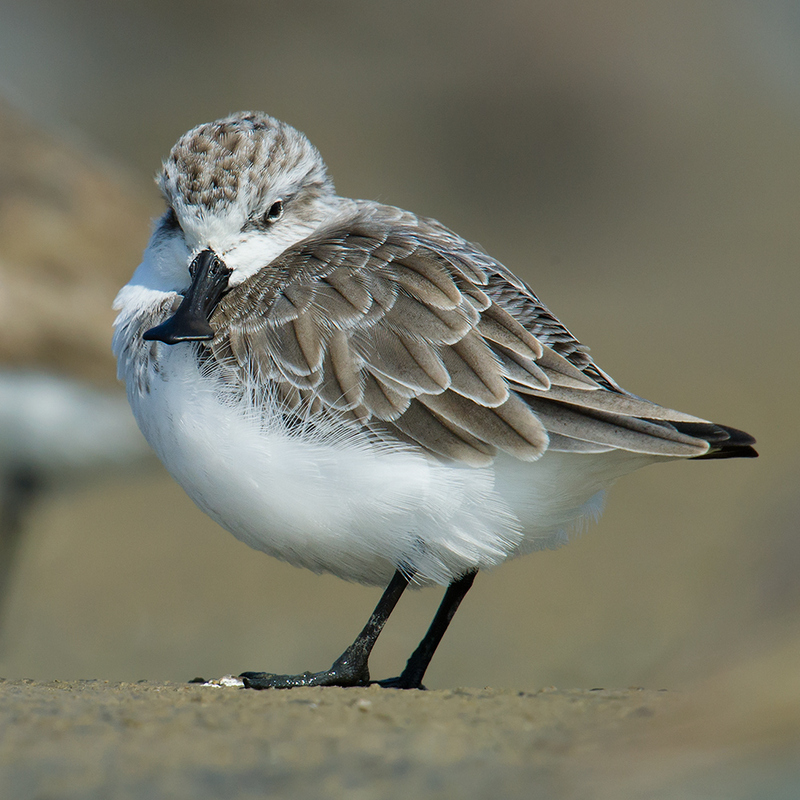 The mudflats are also important as a stopover site for many waders, among them the critically endangered Spoon-billed Sandpiper. 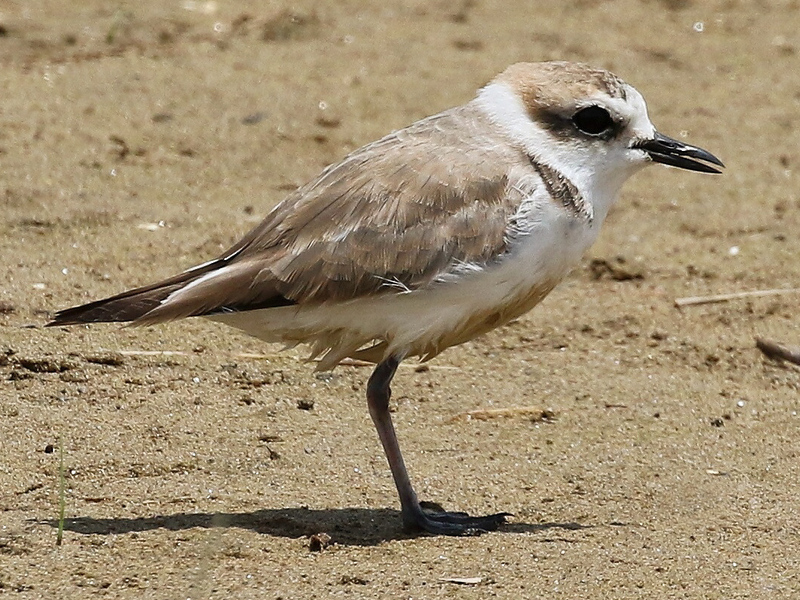 Another bird of interest to Shanghai-based birders is White-faced Plover Charadrius (alexandrinus) dealbatus, a member of the Kentish Plover clade. At Fuzhou it is probably close to the northern border of its breeding range. Foreign visitors need a permit to enter the protected area. 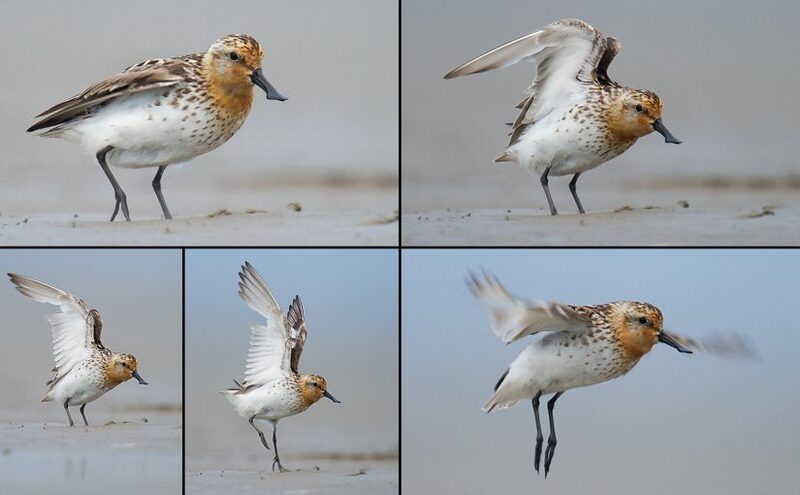 The fee of 1,000 RMB may seem high, but if it can help protect the mudflats and the birds relying on them for survival, then it is money well-spent. Chinese Crested Tern breeds on islets in the Taiwan Strait. For bathing and drinking, the terns use the brackish water close to the mouth of the Minjiang River. They don’t come every day, though, and not outside the breeding season, which lasts from April to September. In fact, the rest of our party had tried the previous day without success. 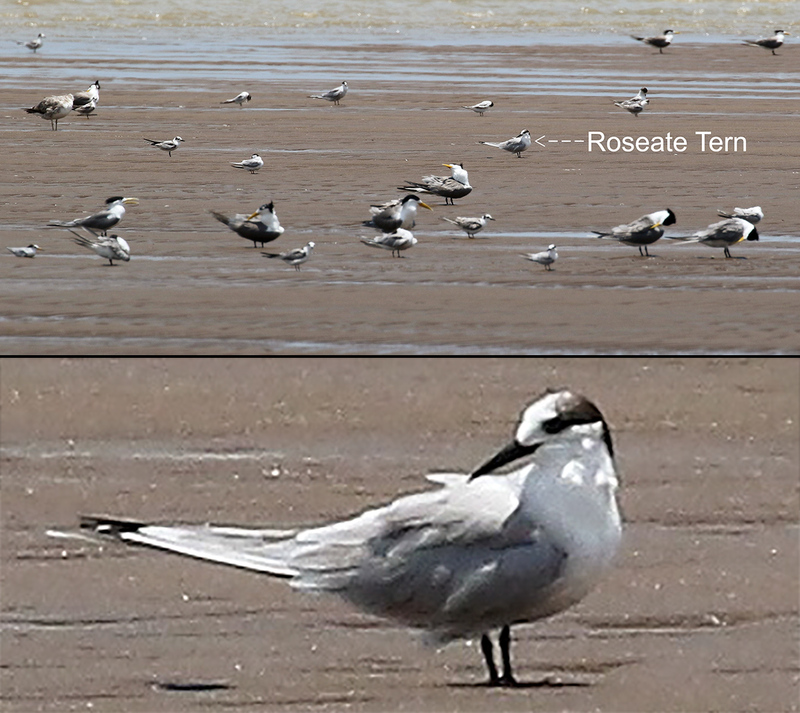 On this day, we were lucky to have 1 adult Chinese Crested Tern join the rest of the roosting terns. It stayed for less than an hour before taking off again, swooping down to drink a couple of times then heading for the strait. Other terns of interest were a couple of briefly visiting Bridled Tern as well as a few Roseate Tern (in both breeding and non-breeding plumages). 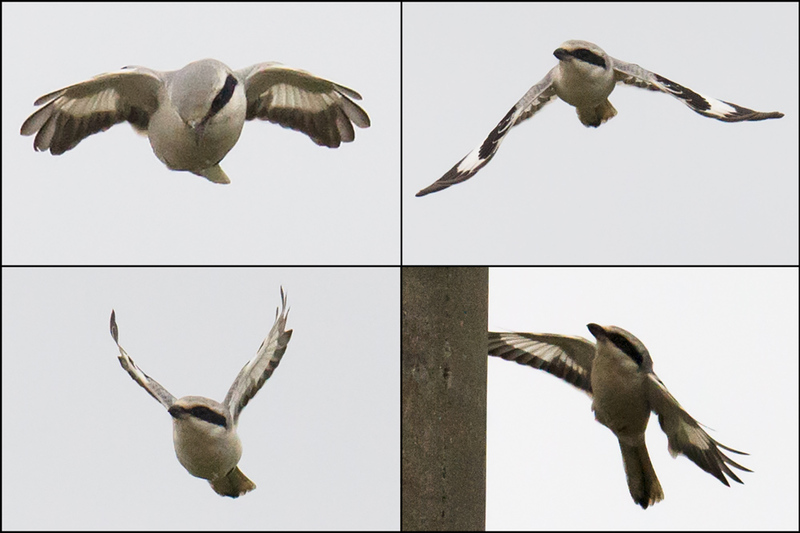 Along with Common Tern, Little Tern, Greater Crested Tern, Whiskered Tern, and White-winged Tern, it all added up to eight species of terns in one day—a record for me. The shoreline also provided 9 Black-faced Spoonbill and various species of wader, among them Grey-tailed Tattler, Terek Sandpiper, Great Knot, Red-necked Stint, Sanderling, Ruddy Turnstone, Pacific Golden Plover, and Greater Sand Plover. 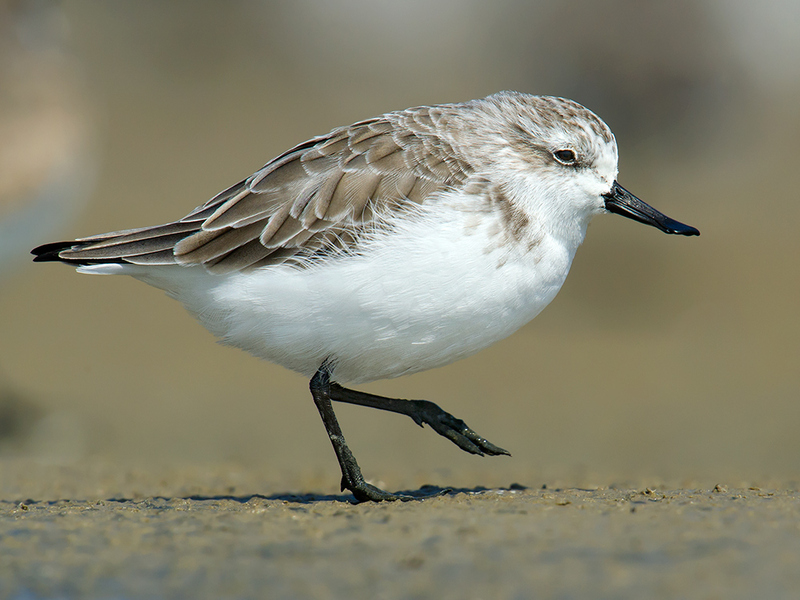 Some Sanderling and Red-necked Stint were in full breeding plumage, so I guess they had already made it up to the Arctic tundra and back. Thinking of the amazing journeys these small creatures perform twice a year, and with the rarest of all species of tern in the bag, I strolled pleasantly through the muddy channels (helped by my waterproof sandals and zip-off trousers). The next morning we got on the high-speed train, and four and a half hours later we were back in Shanghai. Featured image: Daniel Bengtsson and Craig Brelsford pose with their families. 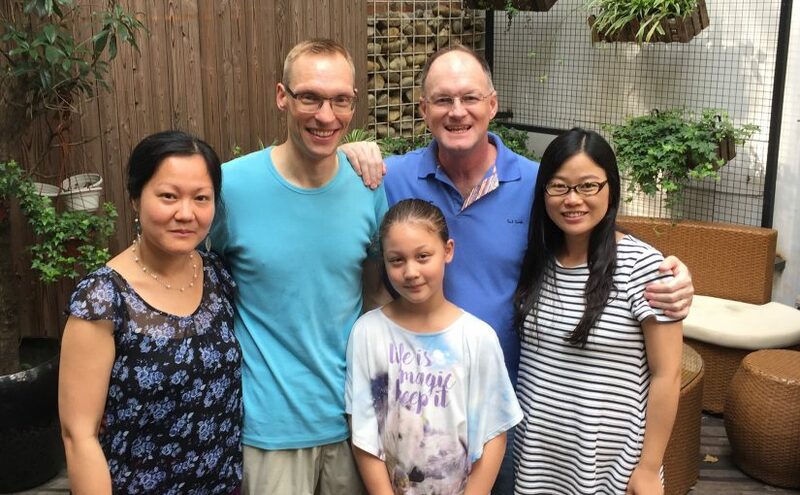 L-R: Daniel’s wife, Zhao Qing (赵清); Daniel Bengtsson; Daniel and Qing’s daughter, Linnea; Craig Brelsford; and Craig’s wife, Elaine Du. Shanghai, 2 July 2017. Editor’s note: With more and more birders operating in Shanghai, more and more vagrant birds are bound to be discovered. 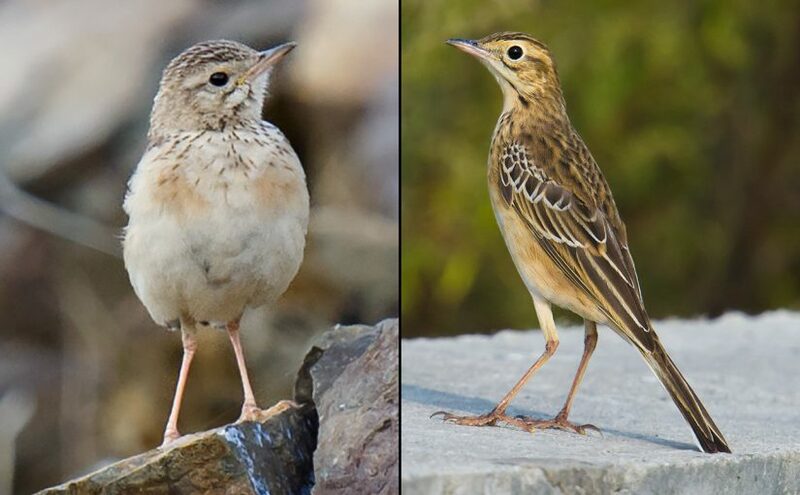 One possibility is Blyth’s Pipit (photo above, L), a species similar to our familiar Richard’s Pipit (R). In this post, I will teach you how to separate the two. 2016 has been an outstanding birding year in Earth’s largest city. Paddyfield Warbler/Manchurian Reed Warbler, seen at Cape Nanhui on 18 Dec., was the latest in a parade of rare visitors seen in Shanghai in 2016. The reason for the surge in good records, I am convinced, is more birders with better skills communicating more effectively. 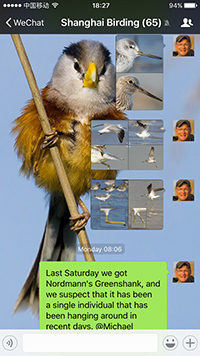 I am proud to say that shanghaibirding.com and the Shanghai Birding WeChat group have played a role. 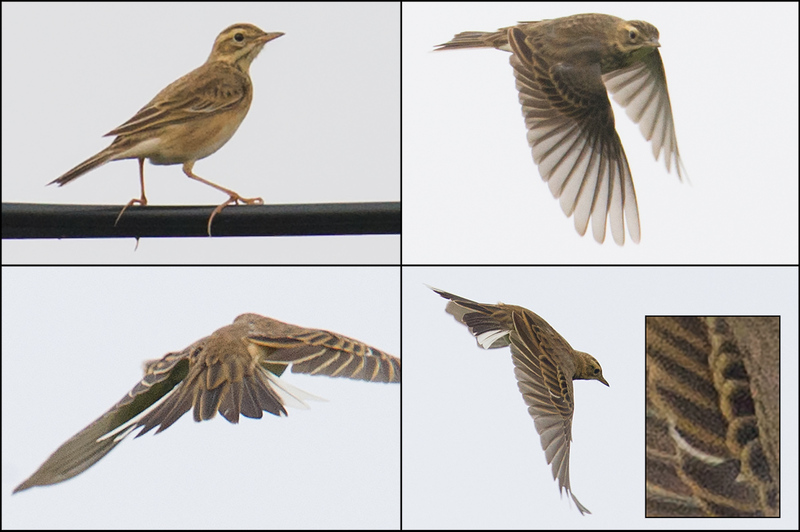 In the Shanghai area, one species that has not yet been reported is Blyth’s Pipit. Anthus godlewskii breeds mainly in Mongolia, occurs on passage in central China, and winters mainly in India, so any records here would be of extralimitals. 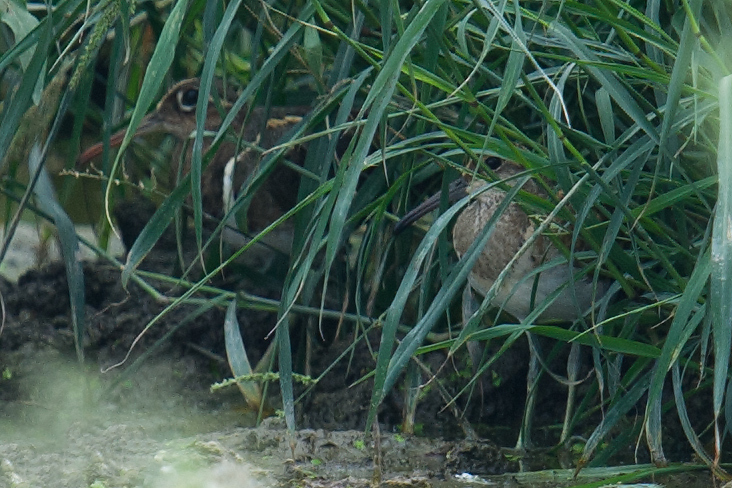 It is just the sort of vagrant that a bigger and better birding community could discover here in Shanghai. The key to getting a Blyth’s in Shanghai is paying attention to the many Richard’s Pipit that we see in the area. Anthus richardi is more or less a passage migrant in the Shanghai area and is recorded here regularly in spring and autumn. Some are present in winter; Elaine Du and I had a “sinensis” last week, the ID’ing of which led to this post. Richard’s “sinensis” is very similar to Blyth’s, being best told by song, which is rarely heard in the Shanghai area. According to Per Alström et al., whose book Pipits and Wagtails is the authority on Palearctic and Nearctic pipits, the song of Blyth’s is “very characteristic and completely different from [that] of Richard’s” (242). During a trip in July 2015 to the Inner Mongolian prefecture of Hulunbeier, one of the few places in China where Blyth’s breeds, I recorded the song. Regarding plumage, the most reliable differentiator of Richard’s and Blyth’s is the pattern of the median coverts. In Blyth’s, a typical adult-type median covert will show well-defined, squarish black centers. In Richard’s, the adult-type median coverts are less clear-cut, rufous-tinged, and triangular. Note that the fresher the plumage, the more reliable this differentiator is. Another less reliable criterion is structure. Shanghai birders will agree that the first impression a non-“sinensis” Richard’s usually gives is “large pipit.” Other pipits, such as Buff-bellied Pipit, Red-throated Pipit, and Olive-backed Pipit, give a “small pipit” impression. Alström et al. say, and I having seen Blyth’s can concur, that a birder viewing Blyth’s will get a “small pipit” impression: “The smaller size, lighter build and shorter tail,” the authors write, “are often most apparent in flight, when [Blyth’s] often recalls one of the smaller pipits rather than Richard’s.” Note also that the smaller size and shorter bill, tail, and hind claw of Blyth’s give that species a “better proportioned” look than the larger and heavier Richard’s (237). The directions above should be seen as guidelines; individual Richard’s and Blyth’s may defy easy categorization, “sinensis” Richard’s even more so. Alström et al. caution against jumping the gun with your ID: “It is crucial to realise that in both species (especially Richard’s) appearance can vary considerably in one and the same individual depending on mood, weather, etc.,” they write. “Also, some Richard’s are structurally very like Blyth’s; this is especially true of southern Chinese Richard’s (‘sinensis’)” (237). 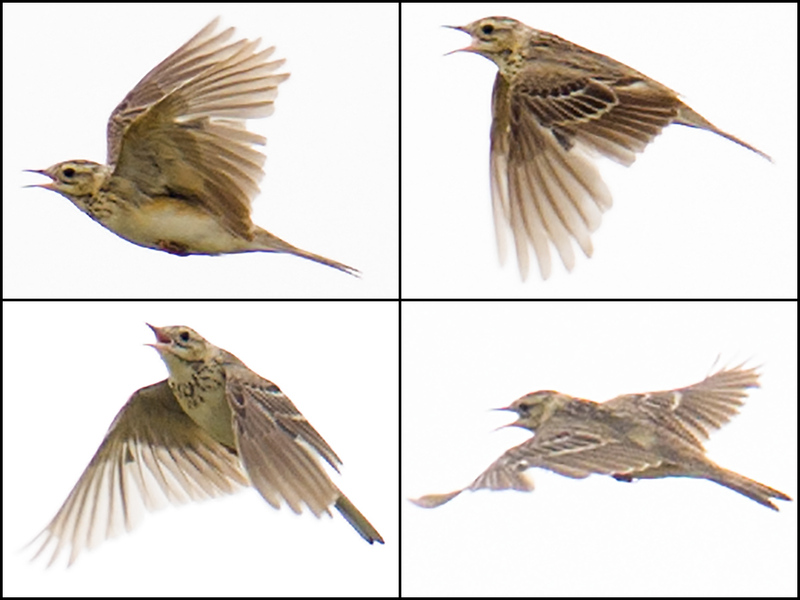 A record of Blyth’s Pipit in Shanghai would shoot to the top of the “Year’s Best” list. The stakes are high, so look diligently, and use caution. Good luck! On 18 Dec. 2016, a quartet of teenage birders found an acrocephalid in the Magic Parking Lot at Cape Nanhui. 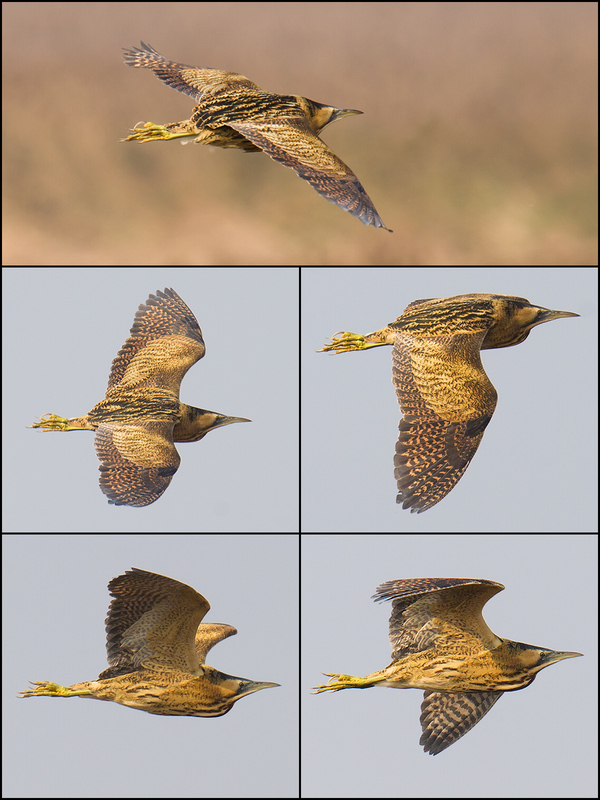 The photos by Komatsu Yasuhiko provoked discussion on the WeChat group Shanghai Birding. The consensus is that the bird is either Paddyfield Warbler Acrocephalus agricola or Manchurian Reed Warbler A. tangorum. 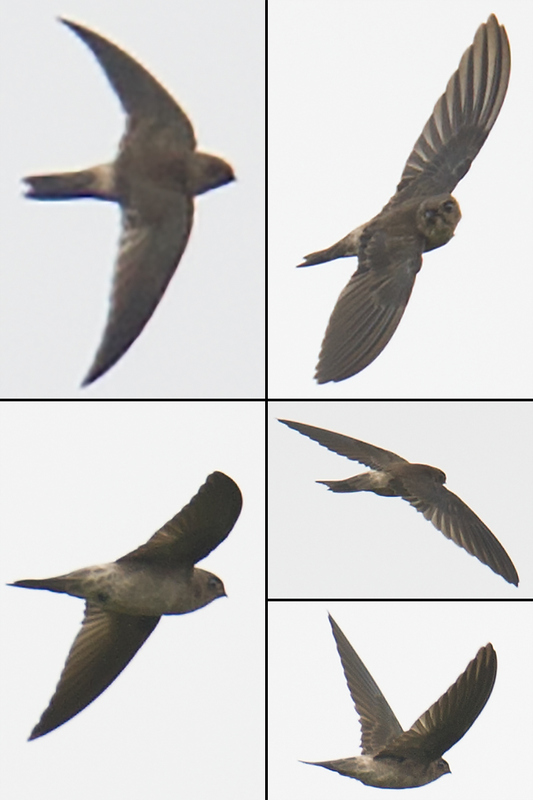 In the images above, note the supercilium, which extends behind the eye; dark eye-line; bright white chin and throat; peach breast band and flanks; bill with black upper mandible and pink lower mandible; and peaked head. 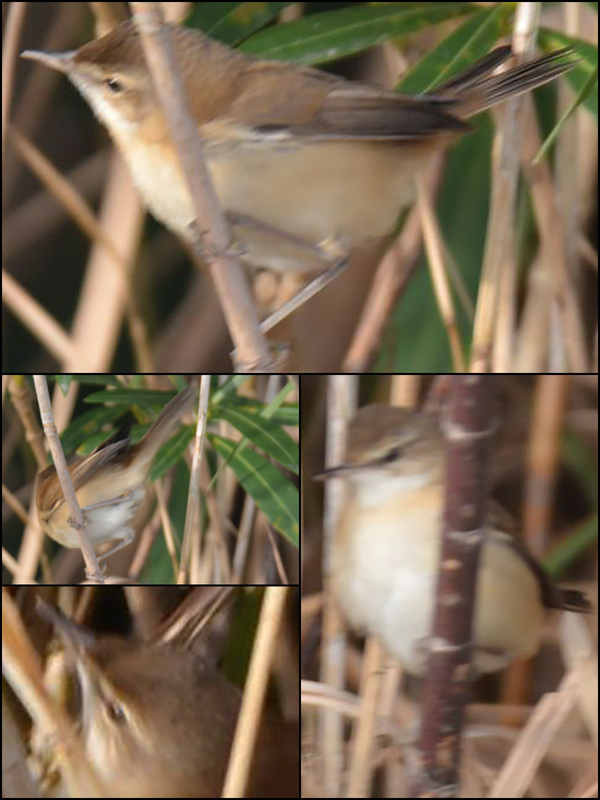 Those criteria most closely indicate Manchurian Reed Warbler and Paddyfield Warbler. Paddyfield Warbler winters mainly in India and would be extralimital here; Manchurian Reed Warbler breeds in northeastern China, is listed as Vulnerable and is therefore scarce, and probably passes through Shanghai. Congratulations to Andy Lee, Komatsu Yasuhiko, Larry Chen, and Archie Jiang for this great Shanghai record. On Thurs. 15 Dec. at Cape Nanhui my wife Elaine Du and I did an interview with Pudong TV in Chinese. The segment will last five minutes and be aired later this month. In the interview I lamented the losses at Nanhui and spoke glowingly of the possibilities. 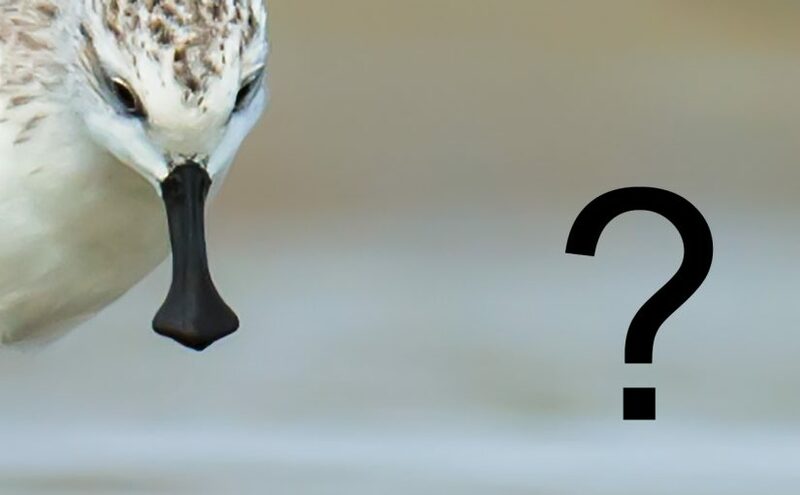 Meanwhile, John MacKinnon, co-author of the most famous bird guide in the history of China and author of a recent post for shanghaibirding.com, has expressed interest in the establishment of an easily accessible, world-class wetland reserve at Cape Nanhui. I created four images to bolster the case for a wetland reserve at Cape Nanhui. Here is the first. Satellite image © 2016 Google. Customized by Craig Brelsford. (1) Cape Nanhui is of extraordinary environmental importance. The tip of the Shanghai Peninsula between the Yangtze River and Hangzhou Bay, Cape Nanhui is a stepping stone for birds migrating across those bodies of water. 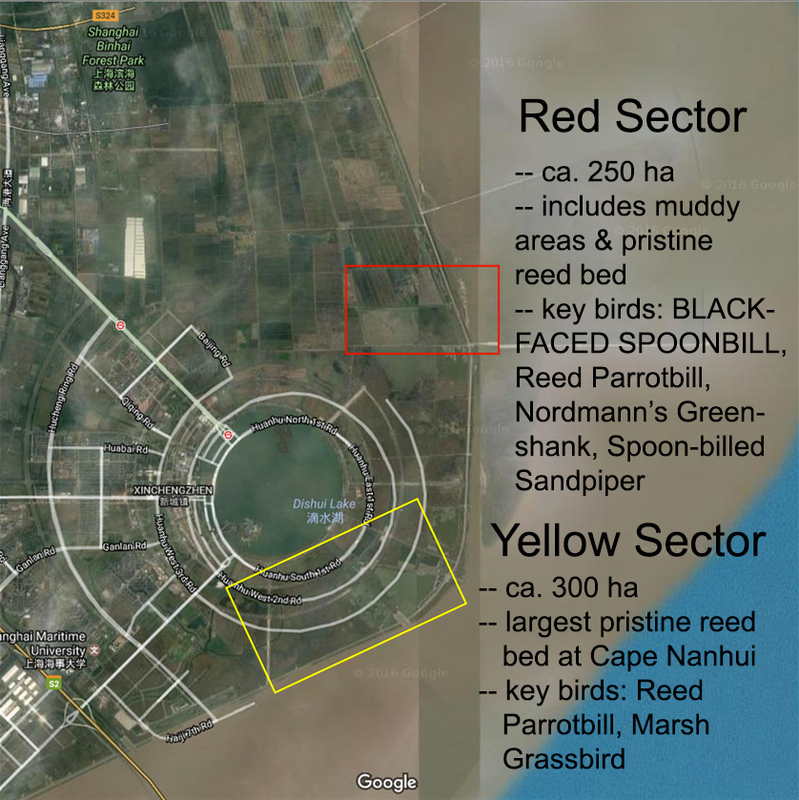 Cape Nanhui also holds large reed beds, habitat critical to Reed Parrotbill, Marsh Grassbird, and other species at risk. The largest component of the city-province of Shanghai is the Shanghai Peninsula, a projection of land between the Yangtze River and Hangzhou Bay. Cape Nanhui is the tip of the peninsula, is a critically important stop for migrating birds, and is completely unprotected. A nature reserve at Cape Nanhui would form a third stepping stone for birds crossing the mouth of the Yangtze, joining the reserves at Chongming Dongtan and Jiuduansha. 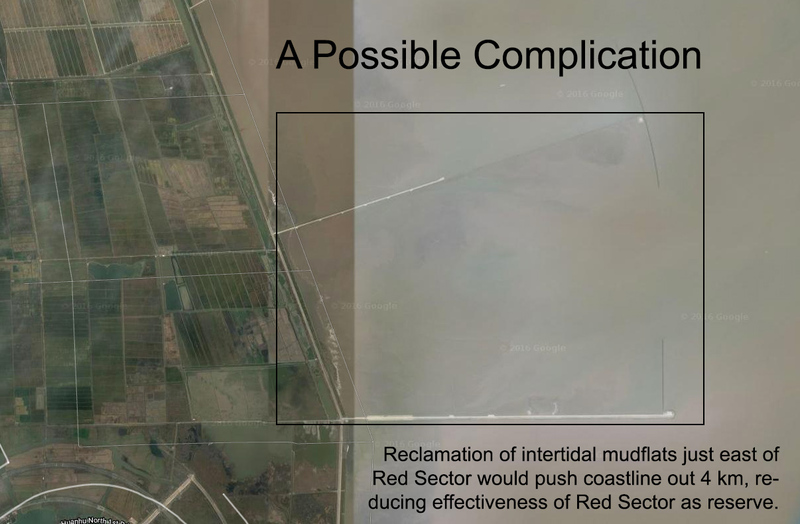 The Red Sector encompasses the defunct wetland reserve at Cape Nanhui. Despite being completely unmanaged and unprotected, the site still attracts many important migratory birds, among them Black-faced Spoonbill. Satellite image © 2016 Google. Customized by Craig Brelsford. 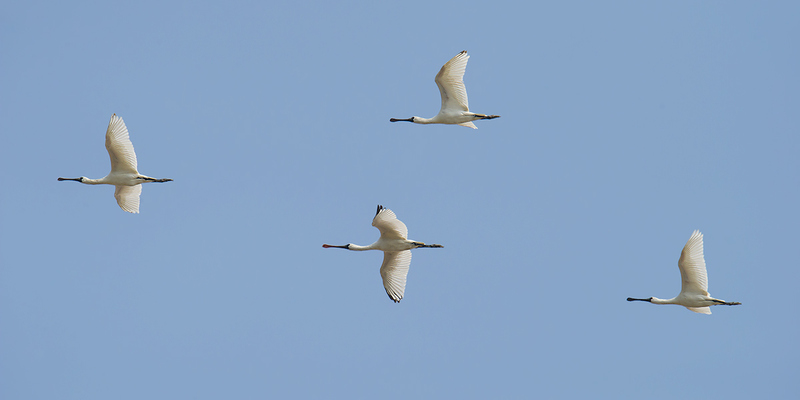 The 2 Red-crowned Crane seen on Sat. 10 Dec. 2016 were the latest in a parade of endangered birds that I and other birders have noted at the Cape over the years. 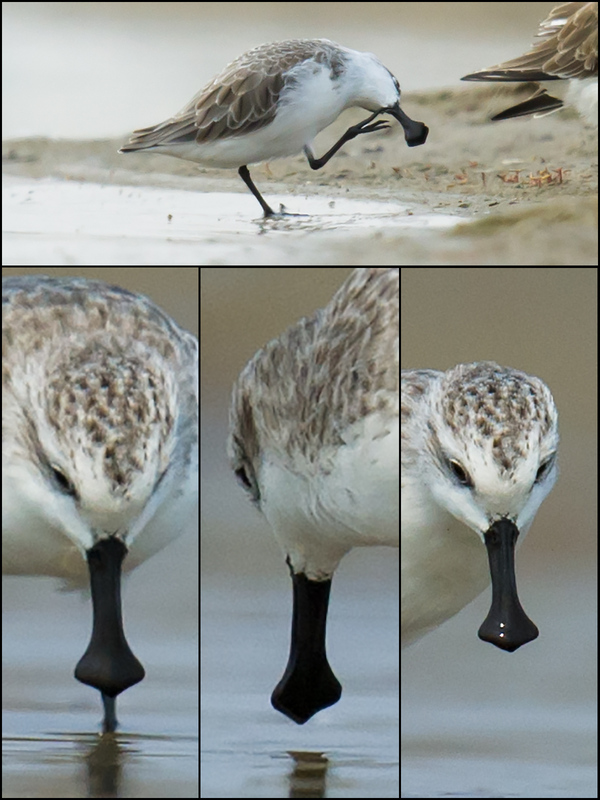 Critically Endangered Spoon-billed Sandpiper uses Cape Nanhui, as does Endangered Nordmann’s Greenshank. Around 2 percent of the world’s Endangered Black-faced Spoonbill are dependent on Cape Nanhui for several months each year. 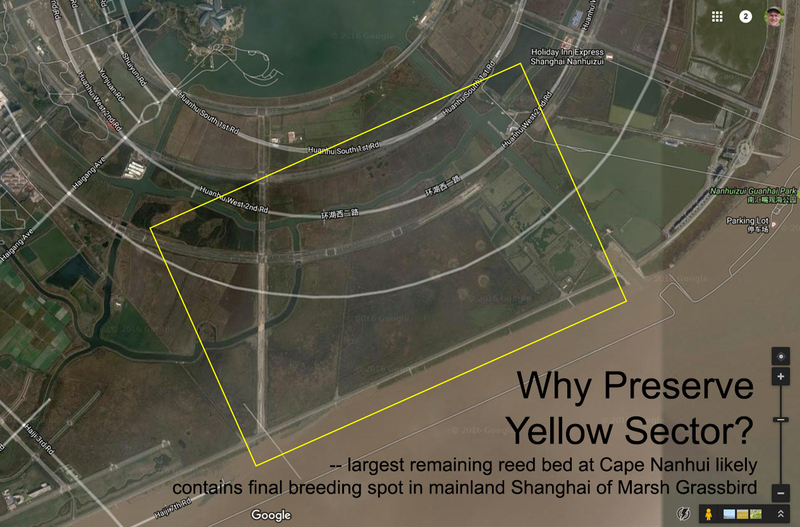 Large reed beds remain at Cape Nanhui and are the final strongholds on the Shanghai Peninsula of Near Threatened Marsh Grassbird and Near Threatened Reed Parrotbill. 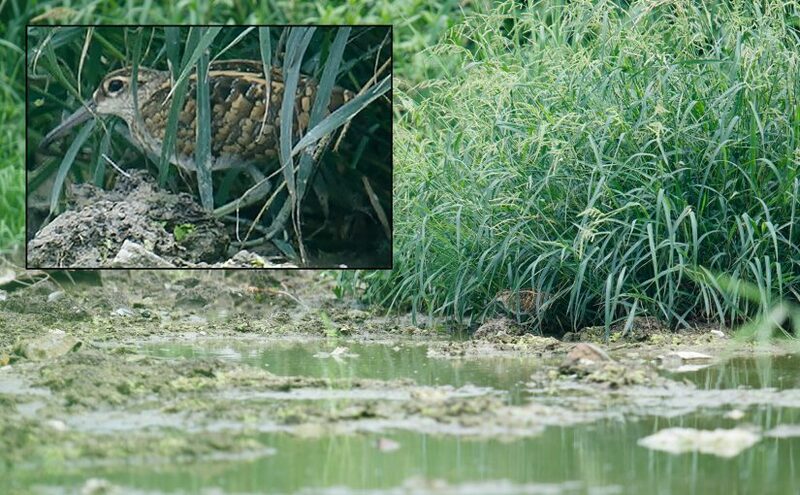 The latter species, a candidate for Shanghai Provincial Bird, will virtually disappear from mainland Shanghai if the reed beds at Nanhui are destroyed. Hundreds of thousands of middle-class children could visit the reserve with their parents using nothing more than the Metro and a quick taxi ride and be sleeping in their own bed that night, dreaming about the wild birds they had seen that day. For millions of parents and their kids, the weekend could be “Saturday, Disney; Sunday, Cape Nanhui Wetland.” A day at a Cape Nanhui Wetland would be an early introduction to the glories of natural Shanghai and would foster an appreciation of the natural world. If Shanghai can be a world economic center and have world-class airports and a world-class skyline and world-class entertainment such as Disney, then it can and must have an easily accessible, world-class reserve protecting its priceless coastline, reed beds, and migratory birds. 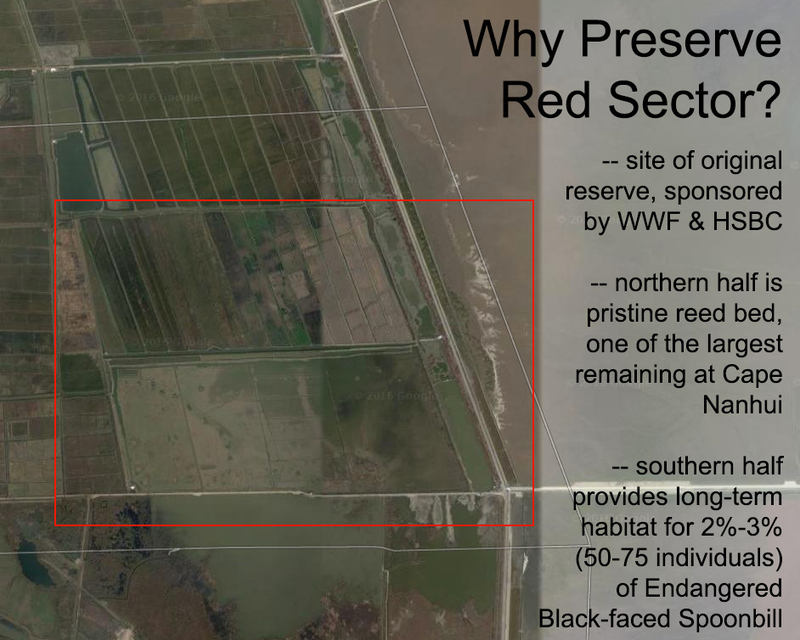 A world-class, easily accessible, wetland nature reserve at Cape Nanhui would become a mecca for birders and achieve world renown, as has been the case with similar reserves such as Mai Po at Hong Kong and Sungei Buloh in Singapore. Alström, Per, Krister Mild & Bill Zetterström. Pipits and Wagtails. Princeton University Press, 2003. This landmark book, co-authored by Shanghai Birding member Per Alström, is my first reference on all things Motacillidae. For the latest bird sightings in Shanghai, join Shanghai Birding! Brazil, Mark. Birds of East Asia. Princeton University Press, 2009. 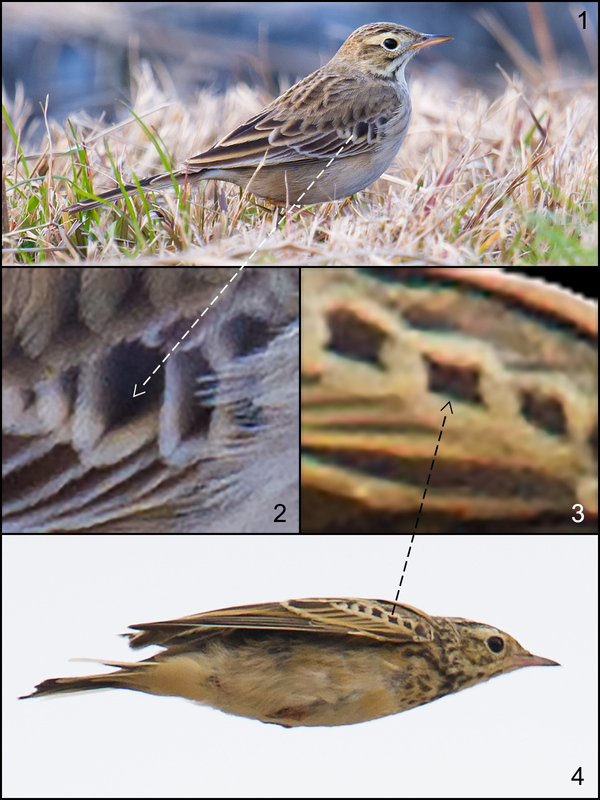 Serviceable descriptions of Blyth’s Pipit and Richard’s Pipit. Illustration of “sinensis.” Good coverage of Paddyfield Warbler, Manchurian Reed Warbler. Brelsford, Craig, moderator. 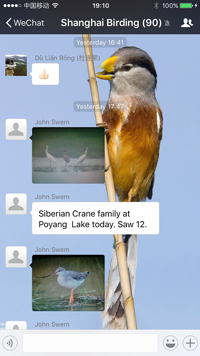 Shanghai Birding, a WeChat chat group. Pipits and reed warblers discussed in detail. Kennerley, Peter & David Pearson. Reed and Bush Warblers. Christopher Helm, 2010. The world standard on Acrocephalidae, Cettiidae, and Locustellidae. Svensson, Lars & Killian Mullarney & Dan Zetterström. Collins Bird Guide, 2nd ed. HarperCollins, 1999-2009. Outstanding illustrations of Richard’s Pipit and Blyth’s Pipit by Mullarney. The report is the latest in a growing list of resources available on shanghaibirding.com. Everything we do here is geared toward showing you what birding is like at the point on the Earth where the world’s greatest migratory flyway meets the world’s greatest city. The report covers 7 March to 24 May 2016. Elaine and I birded 38 of those 79 days and noted 240 species. We partnered with members of our network of subscribers and contributors to shanghaibirding.com. Special thanks to Michael Grunwell and Jan-Erik Nilsén as well as to Xueping Popp, Stephan Popp, Kai Pflug, and Ian Davies. Why should you read “Shanghai-area Springtime Birding, 2016”? Read it to plan your own explorations and to get an idea of what birds you can expect to see in this city in March, April, and May. You’ll find no more complete a report on that subject, anywhere. 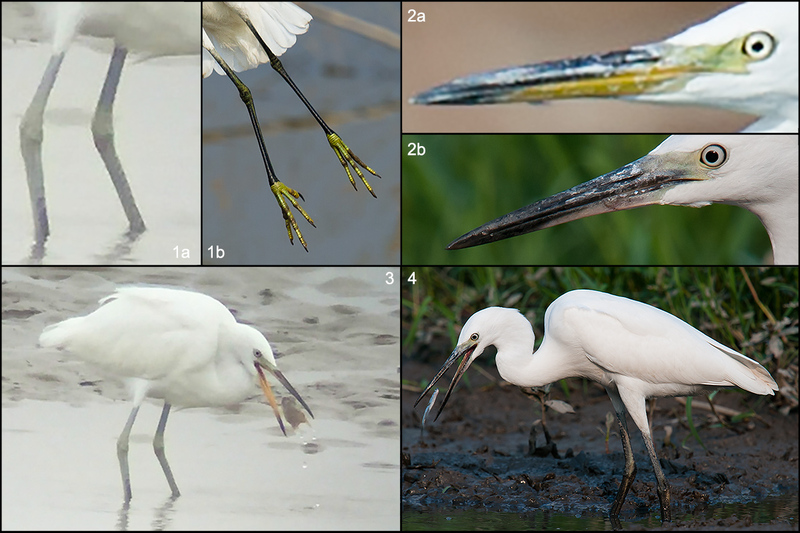 “ — We continued to monitor species under threat by the uncontrolled coastal development afflicting the region, among them the endangered Black-faced Spoonbill, Great Knot, and Yellow-breasted Bunting; near-threatened Eurasian Oystercatcher, Asian Dowitcher, Black-tailed Godwit, Bar-tailed Godwit, Eurasian Curlew, Grey-tailed Tattler, Red Knot, Curlew Sandpiper, Japanese Paradise Flycatcher, Marsh Grassbird, and Reed Parrotbill; and vulnerable Chinese Egret, Saunders’s Gull, and Yellow Bunting. 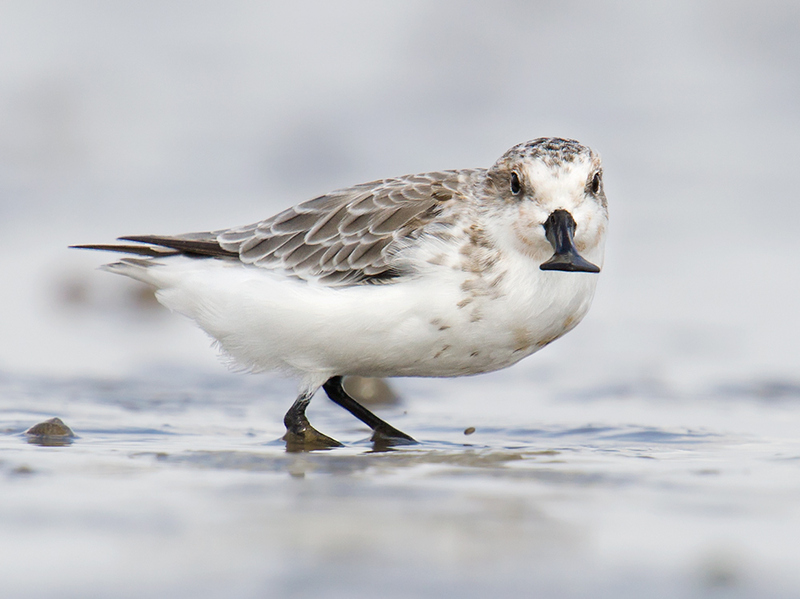 We led a group one of whose members found the critically endangered Spoon-billed Sandpiper. 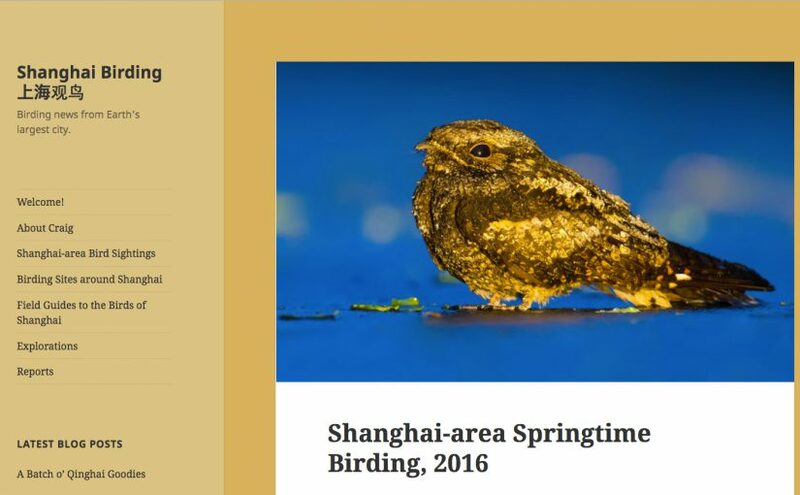 Featured image: Screenshot of our newly published report, “Shanghai-area Springtime Birding, 2016,” now available in the Reports section of shanghaibirding.com. 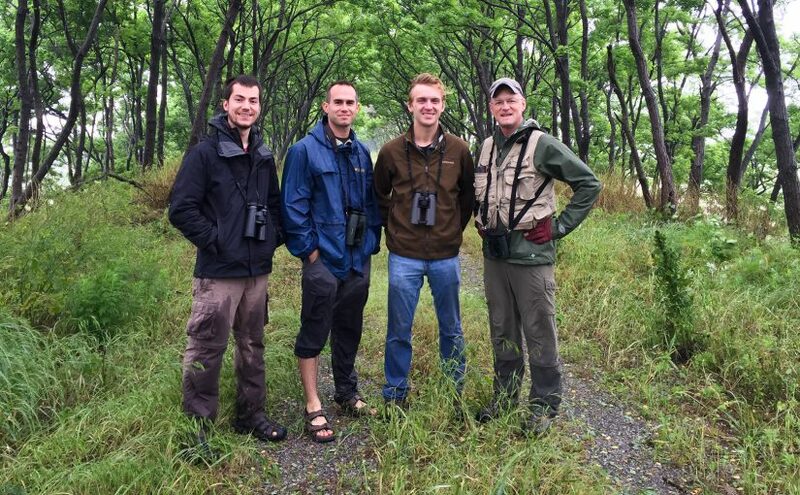 Yangkou-Dongtai today, Elaine and I with Ian Davies from eBird/Cornell and his buddies Nick Bonomo and Luke Seitz. Rain non-stop all day, extremely difficult conditions, missed Nordmann’s Greenshank and Spoon-billed Sandpiper but covered most other major waders, among them Great Knot, Red Knot, Broad-billed Sandpiper, Grey-tailed Tattler, and Eurasian Oystercatcher. 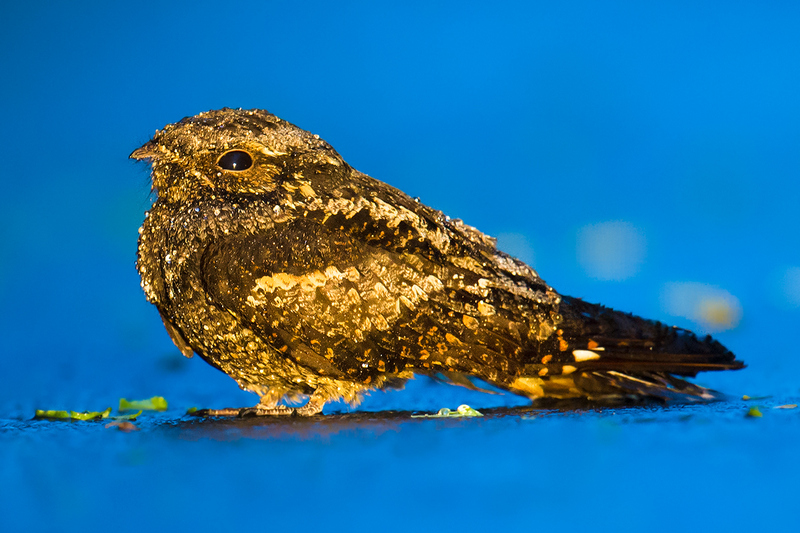 We had a fun encounter with Grey Nightjar roosting on road in forested part of Dongtai Surf ’n’ Turf birding loop. Lifers were piling up for our three young American partners, all on their first trip to China. Fri. 21 May 2016. As darkness was falling, Elaine Du, Ian Davies, Nick Bonomo, Luke Seitz, and I were driving through the coastal forest in Dongtai, Jiangsu. I saw a log on the road and braked. The log was Grey Nightjar roosting on the wet road. Nikon D3S, 600 mm, F5.6, 1/20, ISO 10000 (yes, ten thousand), mirror-up + cable. Yangkou is still good for waders but continues to lose its appeal. Haiyin Temple Forest has been turned into a menagerie, with the obligatory captive Black Swan as well as Blue Eared Pheasant and—get this—a pair of ostriches! The trees remain but the undergrowth has been pared back, limiting the attraction of the migrant trap to thrushes, robins, and bush warblers. Entrance to the menagerie requires payment, but we got around it by saying we were birders. Entrance to the entire temple-seawall area requires ticket costing 60 yuan per person. 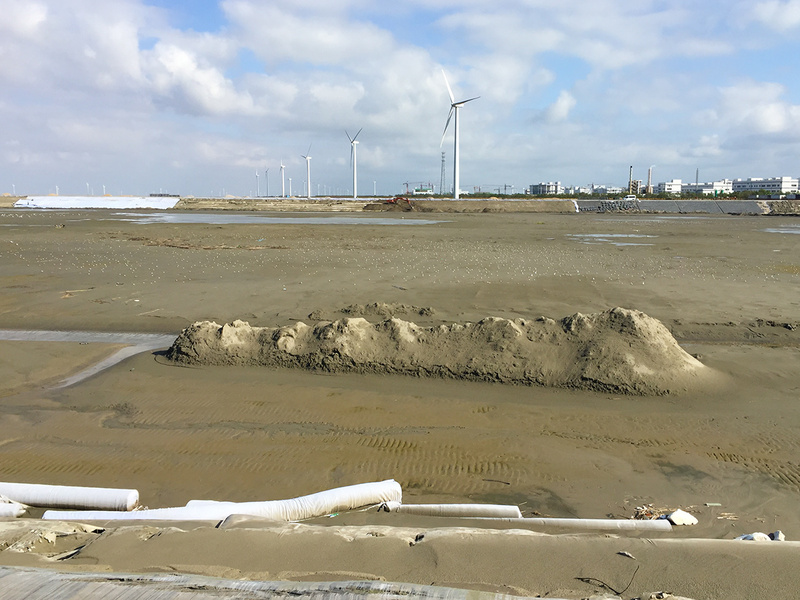 The entire sea wall around Yangkou is now fenced off and access to mudflats is in some places denied, notably at the well-known point ca. 10 km south of town where we have seen Spoon-billed Sandpiper so many times. Dongtai meanwhile continues its own transformation, particularly in the southern parts of the reclaimed area. 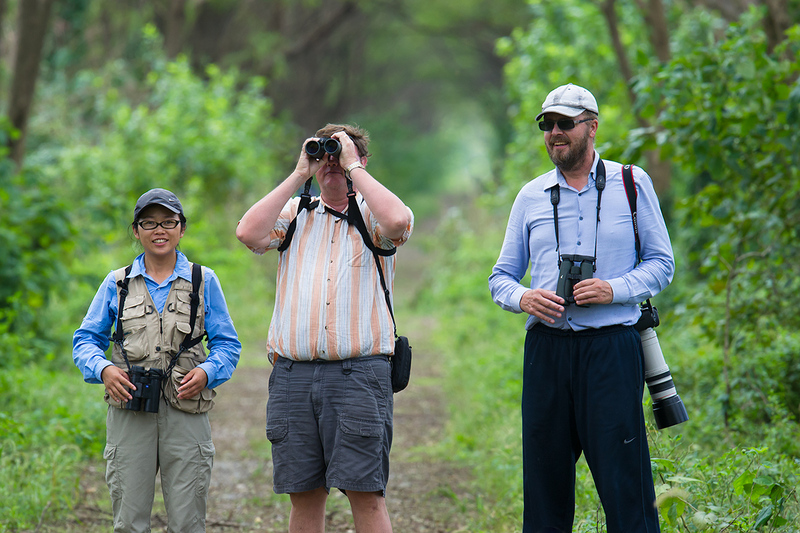 Yangkou again today with Elaine and American birders Ian Davies, Nick Bonomo, and Luke Seitz. 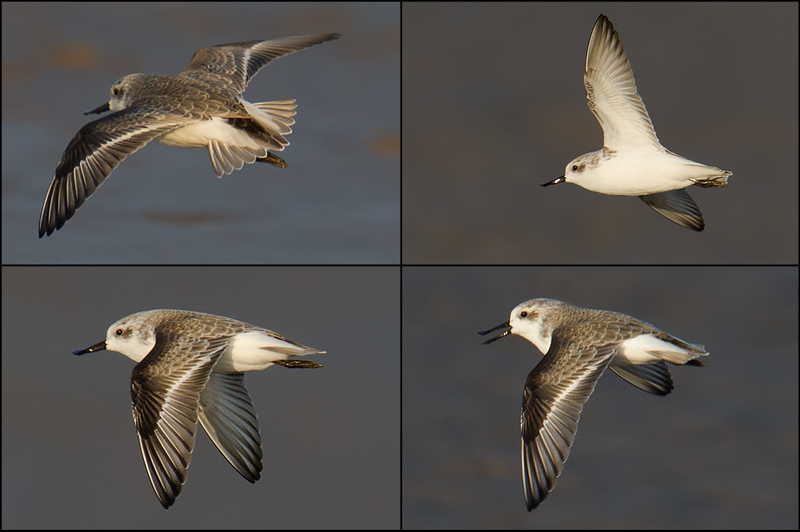 Spoon-billed Sandpiper photographed in flight by Ian after our 4-man group split up on mudflats to cover more ground. Despite relentless search could not find it again. 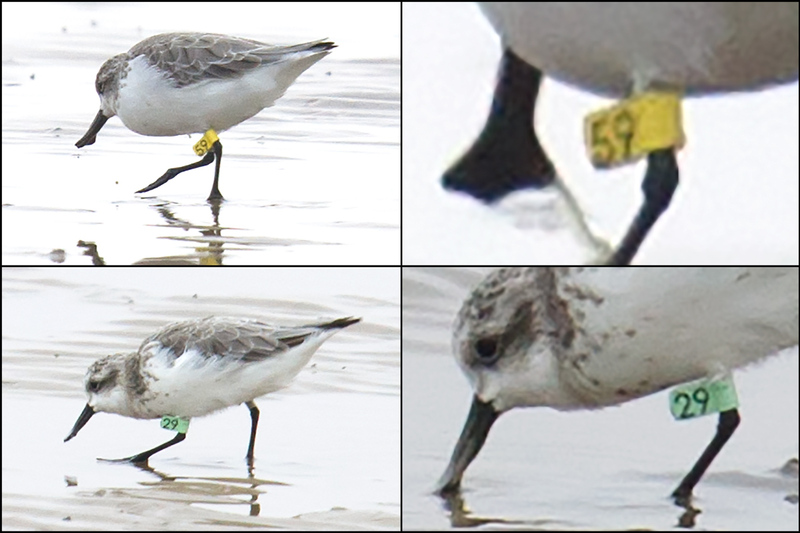 While searching we saw thousands of Red-necked Stint and hundreds of other waders and got soaked in the misty rain. At long-disused Magic Forest we found 33 species in 79 minutes, with Northern Boobook, Lesser Cuckoo, Tiger Shrike, Narcissus Flycatcher, and Forest Wagtail leading the way. The Magic Forest has been locked since 2013, but a guard let us use the area today. It was wonderful to bird the old place again. Our partners were wide-eyed at the richness of the Magic Forest and impressed by the mudflats. Ian trained Elaine and me on the eBird reporting system. Yangkou and Nanhui today, Elaine, U.S. birders Ian Davies, Nick Bonomo, and Luke Seitz, and I (Yangkou), then Elaine and I (Nanhui). At Yangkou mostly around Magic Forest north of Haiyin Temple. Ruddy Kingfisher, Purple Heron, Lesser Cuckoo 2, Asian Koel, Lesser Coucal 3, Arctic Warbler 3 singing, Chestnut-flanked White-eye. Ruddy Kingfisher seen by Ian and Elaine (life bird for both), tragically missed by me! (My view in Nanhui in Oct. 2013 remains my sole sighting of Ruddy King.) Temple Wood still productive (Eyebrowed Thrush, Japanese Paradise Flycatcher). After dropping off Ian, Nick, and Luke at Pudong Airport, Elaine and I continued on to Nanhui. Black-capped Kingfisher, Japanese Para Fly 5, Thick-billed Warbler, Dusky Warbler, Richard’s Pipit. 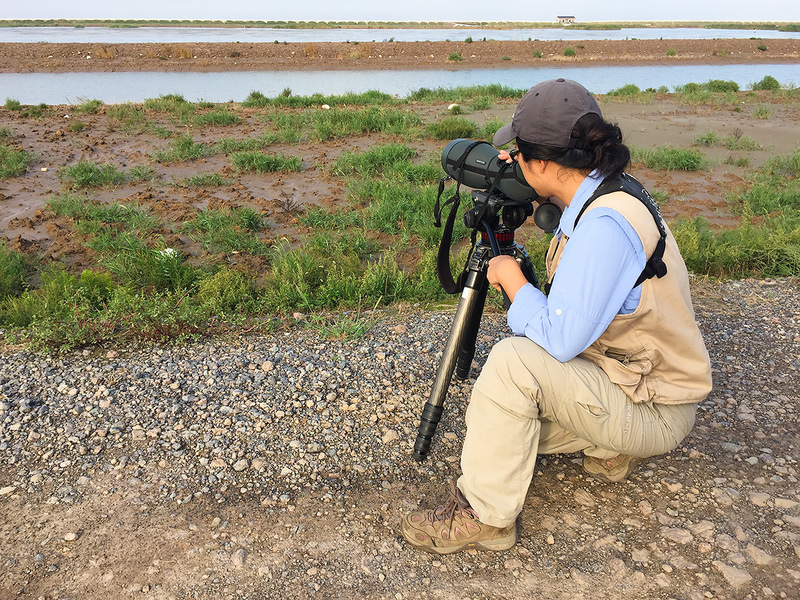 Elaine and I again covered Nanhui, the coastal birding site in southeast Pudong, Shanghai. 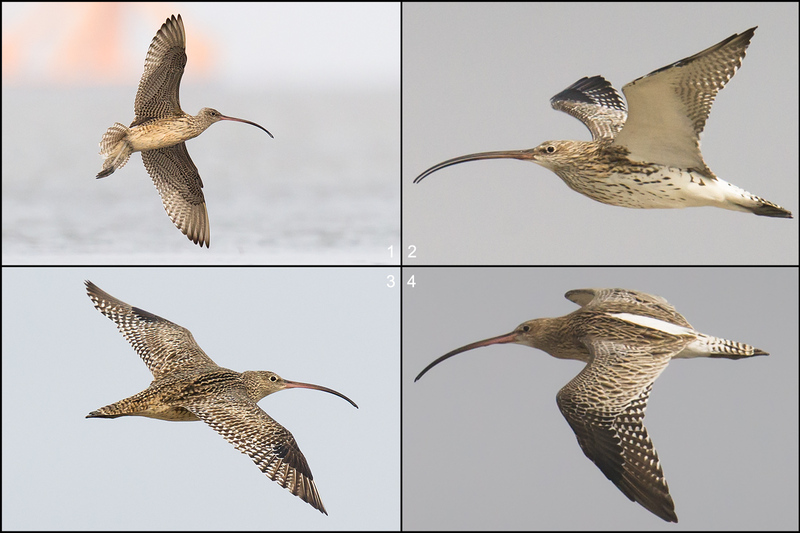 Highlights: Eurasian Bittern 1 booming, Yellow Bittern 6, Common Tern 1 minussensis, Common Cuckoo 18 + 8 Cuculus sp. 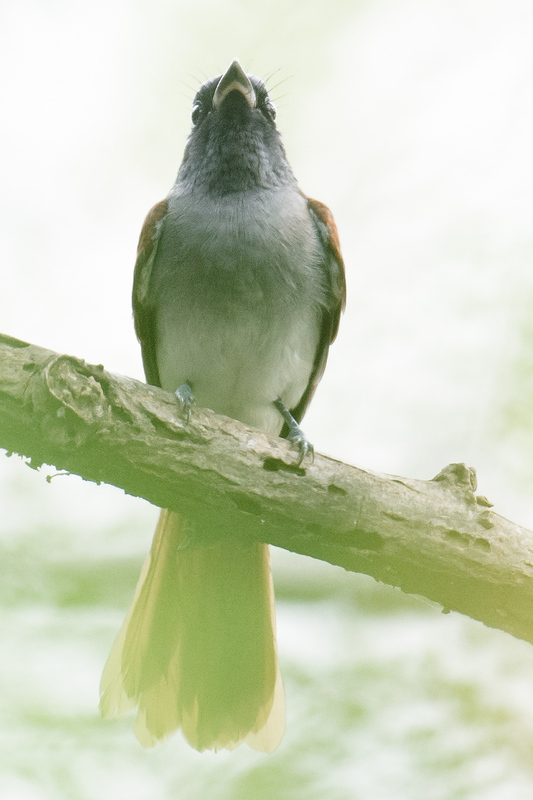 that were probably all Common, Black-winged Cuckooshrike, Black Drongo 28, Japanese Paradise Flycatcher 2 (1 calling), Arctic Warbler 3 singing, Arctic-type Warbler 30 (vast majority likely Arctic), Thick-billed Warbler 2 (1 singing), Narcissus Flycatcher 1 male, Richard’s Pipit. 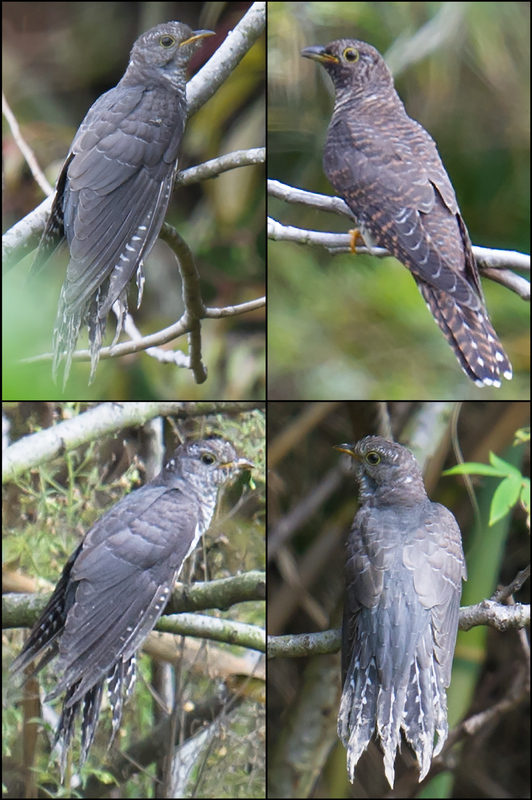 — The cuckoos were in full breeding mode, chasing each other and calling constantly. — Elaine and I spent the better part of an hour walking along the muddy bank of a canal looking for Middendorf’s Grasshopper Warbler. On 21 May 2015 at Nanhui, Kai Pflug, Elaine, and I found this species. Was that encounter a one-off, or is Middendorf’s Gropper a bird that would be recorded more in Shanghai were more birders looking for it? I still don’t have an answer to that question.